This is what an incredulous Con Edison employee said to Windsor Terrace resident Peter Landy when his meter indicated that he wasn’t using any of the utility giant’s electricity. That was two and a half years ago, right after Landy had photovoltaic panels installed on his roof, which convert sunlight into electricity. In other words, he went solar. Through a legislated arrangement called “net-metering,” Landy is able to “sell” his excess energy back into the system and build up credit with Con Ed. In the winter and at night, when the sun is less obliging, he taps into the grid for conventional electricity. “Con Ed is my battery, in a sense,” he explained. In recent years, solar energy use for homeowners has become much more affordable with incentives and rebates from city, state and federal agencies. And Brooklynites are taking advantage of these new bargain prices. This is seriously last minute and I apologize. If you're in Park Slope today at 7pm, be sure check out the Sierra Club and SolarOne event, Solar Soiree at Southpaw (125 Fifth Ave). Details below. Sun. 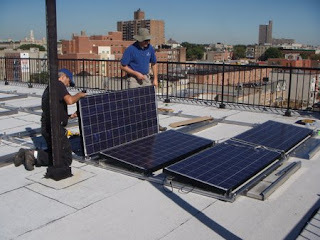 12/7 in our main space, i heart pv presents SOLAR SOIREE, an event for a solar-powered New York! Join the campaign, write letters to your local state legislator in support of pro-solar laws...and enjoy great drink specials for your effort! Build your own solar-powered toy car. FREE, which means no cover. Contact neidl@solar1.org for more details.